Whenever I threaten to cut back on the number of Christmas Cookies I bake each year, I can count on several family members saying "Not the Chocolate Tarts!". These are a labor-intensive cookie but well worth the effort. I shared this recipe with a friend many years ago and she used to say she wasn't sure whether to thank me or not since her children loved them too and demanded they appear on the table every Christmas. Give them a try and let me know whether or not you think they are worth the effort! In the bowl of an electric mixer, beat butter at moderately high speed. Gradually add sugar, beating until well blended. add egg and continue to beat until mixture is light and fluffy. Add chocolate, vanilla, salt and food coloring. Beat to blend. Reduce speed to low and gradually add the flour, scraping sides of bowl often. Remove from bowl, shape into disk, wrap in waxed paper and chill for 30 minutes. Meanwhile, using 2 tablespoons melted shortening and pastry brush, thoroughly grease 6 dozen tiny tart pans. 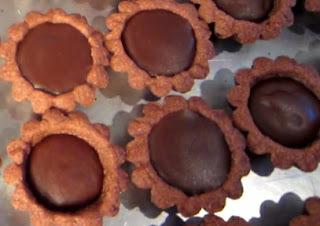 To line each mold, take a rounded teaspoonful of the dough and shape it into a ball, fill all molds. With your fingers, press the ball of dough onto the bottom and sides of the mold in a thin layer. 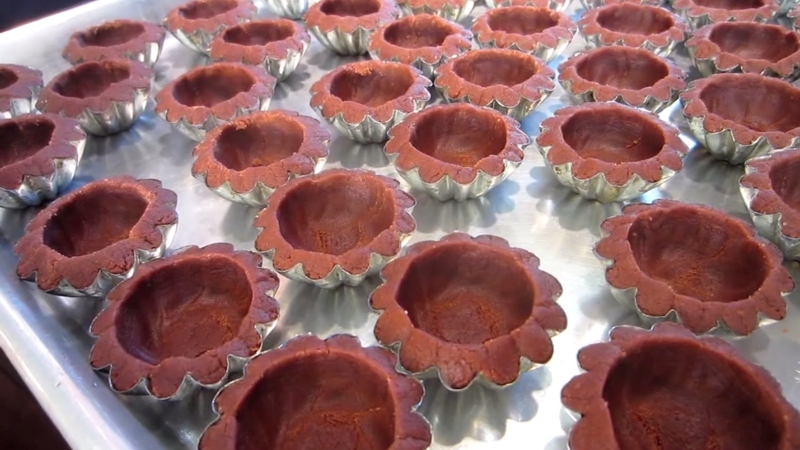 Place molds on cookie sheets and bake at 350° for 15 minutes. With a paring knife, gently loosen cookie cups from molds. Place on wire racks to cool completely. Fill each about ¾ full with Fudge Filling. Let stand at room temperature until filling is set. Combine all ingredients in a heavy saucepan. Place over moderate heat and stir until chocolate and butter are melted; bring to a boil. Remove pan from heat. Stir vigorously until mixture is slightly thickened but still pours. Keep warm over hot water or very low heat. Spoon into Chocolate Tarts. The red food coloring helps to make a contrast between the cookie dough and the filling. You may eliminate it but I think it makes for a better looking tart. I have been searching for the tart pans for ages. Mine are well over 40 years old and I bought them from Maid of Scandinavia - a company long since gone. The nearest I have seen are from New York Cake Supply but they are over 2 inches in diameter - the ones I use are just over an inch. If you are successful in finding them, please let me know. Happy Holidays!